Bicep Brachii 2 heads- top of the corocoid process and the upper lip of the glenoid fossa. Tuberosity of the radius. 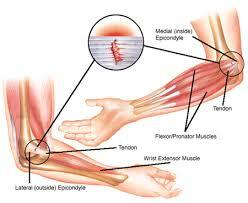 Flexion of the elbow.Supination of the forearm. Easily palpated on the anterior aspect of the humerus. Brachialis Lower ½ of the anterior portion of the humerus. Corocoid process of the humerus. Flexs the elbow Lateral side of the upper arm under the biceps muscle. Tricep Long Head –lower edge of the glenoid cavity of the scapula.Lateral Head – upper ½ of the posterior surface of the humerus. Medial Head – lower 2/3rds of the posterior surface of the humerus. 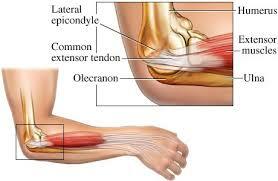 Olecranon process of the ulna. Extends the elbow Posterior and lateral aspects of the humerus.